This is an important message for all PPC Bid Max users. There is a major update for PPC BidMax. All users need to download the latest version of PPC BidMax v5.4.196 before 30 Jan 2019 in order to have your software work properly with these changes. 2. Close PPC BidMax before installating. 3. Run the Installer/Updater to update the program to the latest version. We’re very sorry for any inconvenience and delay caused. Please contact us at support@apexpacific.com if you have any questions or need any further assistance. A new version 8.0.117 of SEO Suite for Keyword Builder is available. If your current version is 8.0.116 or older, or if you have problem with the Keyword Builder function, please download the new update version from http://www.apexpacific.com/software/seosetup.exe. You do NOT need to uninstall the current version before install. Simply install the new version on top of the old version. This is a 2nd reminder for all PPC Bid Max users. There is a major update for PPC BidMax. If your current version is 5.4.187 or older, you need to download the latest version of PPC BidMax v5.4.188 before 28th March 2018 in order to have your software work properly with these changes. All users need to download the latest version of PPC BidMax v5.4.188 before 1 April 2018 in order to have your software work properly with these changes. This is an important message for all PPC Bid Max users. There is a major update for Bing for PPC BidMax. All users need to download the latest version of PPC BidMax v5.4.187 before 30th October 2017 in order to have your software work properly with these changes. All users need to download the latest version of PPC BidMax v5.4.186 before 30th September 2017 in order to have your software work properly with these changes. A new version 8.0.113 of SEO Suite for Keyword Builder is available. If your current version is 8.0.112 or older, or if you have problem with the Keyword Builder function, please download the new update version from http://www.apexpacific.com/software/seosetup.exe. Please feel free to contact support@apexpacific.com if you need any further assistance. All users need to download the latest version of PPC BidMax v5.4.181 immediately in order to have your software work properly with these changes. All users need to download the latest version of PPC BidMax v5.4.80 immediately in order to have your software work properly with these changes. A new version 8.0.101 of SEO Suite for Keyword Builder is available. If your current version is 8.0.109 or older, or if you have problem with the Keyword Builder function, please download the new update version from http://www.apexpacific.com/software/seosetup.exe. All users need to download the latest version of PPC BidMax v5.4.179 immediately in order to have your software work properly with these changes. This is a second reminder for all PPC Bid Max users. Please read this message carefully. There is a major update for PPC BidMax. All users need to download the latest version of PPC BidMax v5.4.176 immediately in order to have your software work properly with these changes. All users need to download the latest version of PPC BidMax v5.4.175 immediately in order to have your software work properly with these changes. All users need to download the latest version of PPC BidMax v5.4.170 immediately in order to have your software work properly with these changes. All users need to download the latest version of PPC BidMax v5.4.167 immediately in order to have your software work properly with these changes. This is an important message for all PPC Bid Max users. There is a major bug fixing for PPC BidMax. All users need to download the latest version of PPC BidMax v5.4.165 immediately in order to have your software work properly with these changes. 2. Please run the Installer/Updater to update the program to the latest edition. This is an important message for all PPC Bid Max users. There has been a major update for Google Adwords API to v201502. All users need to upgrade to the latest version of PPC BidMax v5.4.164 before 1 July 2015 in order to have your software work properly with these changes. All users need to download the latest version of PPC BidMax v5.4.164 immediately in order to have your software work properly with these changes. Since we released the new Version Update last week, there are a number of bugs has been fixed. Please follow the instructions below to download and install the latest version 5.4.157. 3. Run the Installer/Updater to update the program to the latest edition. Please contact us at support@apexpacific.com if you have any questions or need any further assistance. All users need to download the latest version of PPC BidMax v5.4.156 on or before 12 November 2014 in order to have your software work properly with Google Adwords. This is a final reminder for SEO Suite Keyword Builder Update 8.0.101. A new version 8.0.101 of SEO Suite for Keyword Builder is available. If your current version is 8.0.100 or older, or if you have problem with the Keyword Builder function, please download the new update version from http://www.apexpacific.com/software/seosetup.exe. This is an important message for all PPC Bid Max users. There has been a major update for Google Adwords API to v201409. All users need to download the latest version of PPC BidMax v5.4.156 immediately in order to have your software work properly with these changes. This is an important message for all PPC Bid Max users. There has been a major update for Google Adwords API to v201406. All users need to download the latest version of PPC BidMax v5.3.148 immediately in order to have your software work properly with these changes. This is an important update for all PPC Bid Max users. Google ClientLogin method is expected to change after June 2014. Now, you need to download the last version 5.3.135 of PPC BidMax to upgrade to the new oAuth 2.0. Please visit here for more details. If your current version is older than v5.3.135, your software will not longer working from 1 June 2014. Please download the latest version 5.3.135 of PPC BidMax immediately in order to have your software work properly with these changes. 3. Please click the link here and follow the instruction carefully on the page to re-set your Access Token. NOTE: If you don't re-set your Access Token as above link, your program will not longer working. A new version 8.0.94 of SEO Suite for Keyword Builder is available. If your current version is 8.0.93 or older, or if you have problem with the Keyword Builder function, please download the new update version from http://www.apexpacific.com/software/seosetup.exe. This is an important final reminder for all PPC Bid Max users. There has been a major update for Google Adwords API to v201309. If your current version is older than v5.3.127, your software will not longer working from November 09th 2013. Please download the latest version of PPC BidMax v5.3.127 immediately in order to have your software work properly with these changes. This is an important message for all PPC Bid Max users. There has been a major update for Google Adwords API to v201309. All users need to download the latest version of PPC BidMax v5.3.126 immediately in order to have your software work properly with these changes. This is an important final reminder for all PPC Bid Max users. There has been a major update for Google Adwords API to v201302. If your current version is older than v5.3.121, your software will not longer working from July 15th 2013. Please download the latest version of PPC BidMax v5.3.121 immediately in order to have your software work properly with these changes. This is an important message for all PPC Bid Max users. There has been a major update for Google Adwords API to v201302. All users need to download the latest version of PPC BidMax v5.3.121 immediately in order to have your software work properly with these changes. A new version 1.0.116 is available. If your current version is 1.0.115 or older, please download the new update version from http://www.apexpacific.com/software/xgenseo.msi. A new version 8.0.83 of SEO Suite for Keyword Builder is available. If your current version is 8.0.82 or older, or if you have problem with the Keyword Builder function, please download the new update version from http://www.apexpacific.com/software/seosetup.exe. A new version 1.0.114 is available. If your current version is 1.0.113 or older, please download the new update version from http://www.apexpacific.com/software/xgenseo.msi. This is an important message for all PPC Bid Max users. There has been a major update for Google Adwords API to v201209. All users need to download the latest version of PPC BidMax v5.3.108 immediately in order to have your software work properly with these changes. A new version 8.0.82 is available. If your current version is 8.0.81 or older, please download the new update version from http://www.apexpacific.com/software/seosetup.exe. A new version 1.0.111 is available. If your current version is 1.0.110 or older, please download the new update version from http://www.apexpacific.com/software/xgenseo.msi. A new version 1.0.110 is available. If your current version is 1.0.109 or older, please download the new update version from http://www.apexpacific.com/software/xgenseo.msi. If you already updated to the latest version through the auto-updater, please ignore this message. A new version 1.0.109 is available. If your current version is 1.0.108 or older, please download the new update version from http://www.apexpacific.com/software/xgenseo.msi. A new version 5.3.105 is available. If your current version is 5.3.104 or older, please download the new update version from http://www.apexpacific.com/software/bidmax50_update.exe. A new version 1.0.108 is available. If your current version is 1.0.107 or older, please download the new update version from http://www.apexpacific.com/software/xgenseo.msi. A new version 1.0.107 is available. If your current version is 1.0.106 or older, please download the new update version from http://www.apexpacific.com/software/xgenseo.msi. A new version 1.0.106 is available. If your current version is 1.0.105 or older, please download the new update version from http://www.apexpacific.com/software/xgenseo.msi. A new version 1.0.105 is available. If your current version is 1.0.104 or older, please download the new update version from http://www.apexpacific.com/software/xgenseo.msi. A new version 1.0.104 is available. If your current version is 1.0.103 or older, please download the new update version from http://www.apexpacific.com/software/xgenseo.msi. A new version 1.0.103 is available. If your current version is 1.0.102 or older, please download the new update version from http://www.apexpacific.com/software/xgenseo.msi. A new version 1.0.102 is available. If your current version is 1.0.101 or older, please download the new update version from http://www.apexpacific.com/software/xgenseo.msi. This is an important update reminder regarding MSN AdCenter. If you are currently managing MSN Adcenter with PPC BidMax, please read this message carefully. There is a major upgrade for MSN Adcenter API v8. All users need to download the latest version of PPC BidMax v5.2.94 in order to get MSN Adcenter to work properly. If you don't upgrade to the latest version 5.2.94 by 30 Septembet 2011, your PPC BidMax will stop working for MSN Adcenter. A new version 1.0.101 is available. If your current version is 1.0.100 or older, please download the new update version from http://www.apexpacific.com/software/xgenseo.msi. This is an important update for MSN AdCenter. If you are currently managing MSN Adcenter with PPC BidMax, please read this message carefully. There is a major upgrade for MSN Adcenter API v8, all users need to download the latest version of PPC BidMax v5.2.94 in order to get MSN Adcenter to work properly. If you don't upgrade to the latest version 5.2.94 by 30 Septembet 2011, your PPC BidMax will stop working for MSN Adcenter. A new version 1.0.100 is available. If your current version is 1.0.99 or older, please download the new update version from http://www.apexpacific.com/software/xgenseo.msi. A new version 1.0.99 is available. If your current version is 1.0.98 or older, please download the new update version from http://www.apexpacific.com/software/xgenseo.msi. A new version 1.0.98 is available. If your current version is 1.0.97 or older, please download the new update version from http://www.xgenseo.com/software/xgenseo.msi. Please NOTE: we also updated the license registration system, if you receive Access Denied error, please simply re-enter your License Key to re-register the program. A new version 1.0.97 is available. If your current version is 1.0.96 or older, please download the new update version from http://www.apexpacific.com/software/xgenseo.msi. With this update, 28 new social sites have been added including 25 Ping sites and 3 RSS Aggregator sites. There is no account creation request for Ping and RSS aggregator sites, so you can submit to Ping and RSS Aggregator sites directly. More social sites will be added in next few weeks, including more blog, article directory and bookmarking sites. We are also working on the multithread function for the article submission and account creation process. This will improve the speed and make the program 10 times faster than before. You will receive an auto-update once the new function is available. Previously, we requested that you do NOT link your Google Adwords account with Apex MCC when using PPC BidMax to manage your Adwords accounts. Instead, we asked you to use the default PPC Bid Max API quota, which varied depending on your monthly plan. If you exceeded your API quota we asked you to purchase additional API quota from Apex to continue use the software. We are now applying for the Google Adwords Preferred API pricing program in order to get free API quota from Google. This free API quota will be passed onto our clients. If we are approved for the Preferred API pricing program by Google, it will allow us to remove the API quota limit restriction and you will have unlimited API usage with PPC BidMax. In order for us to quality for the Google Adwords Preferred API Pricing program, we need to have at least 10 linked accounts in our MCC account. As such, we ask that you link your Adwords account to our Apex MCC account. This will allow us to get approval from Google for free API usage so everyone will benefit from this free API. Could you please provide your Adwords account ID or your MCC account ID if you are an agency? We will send you the invitation to link your Adwords account to Apex MCC account and you only need to allow for API access. We understand your privacy concerns and we assure you that we will never access your account at any time. This requirement is for getting approval for Google Adwords Free API usage only. If we cannot get the 10 linked accounts to our MCC accounts, then we will not qualify for Google Adwords Preferred API pricing program. In this case, you will continue to be limited to the default API usages and continue to pay higher API fees if you exceed your API quota. So please help us make everything easier and more cost effective for you by providing your Google Adwords account ID or your MCC account ID if you are an agency asap. If you have any questions about this, please feel free to contact us at http://www.apexpacific.com/contactus.html. There will be a scheduled database maintenance which we will be performing on Sunday the 19th of June 2011 at 3:00 PM Pacific Standard Time. This database maintenance will cause downtime for ‘Email Tracker’ with Mail Communicator. We expect an interruption in the Email Tracking service for approximately 12 hours. Please do NOT send any email campaign during this time if you want to use Email Tracker function. All email sent during this time will not be tracked. While we understand concerns that an interruption in service is inconvenient, this database maintenance is necessary to ensure the stability of our services. We apologise in advance for any disruption this may cause you. Please contact us if you have any questions regarding this scheduled database maintenance. A new version 1.0.96 is available. If your current version is 1.0.95 or older, please download the new update version from http://www.xgenseo.com/software/xgenseo.msi. This is an important announcement for all XGen SEO users, please read this message carefully. We have found that Internet Explorer 9 is NOT compatible with XGen SEO. If you have installed Internet Explorer 9 you will experience problems with xGen SEO. To prevent any unnecessary problems with XGen SEO, please do NOT upgrade your Internet Explorer to version 9. If you have already installed IE 9, we would like to suggest that you downgrade from IE 9 to version IE8, or alternatively please install XGen SEO on another computer with IE 8. Our developers are currently looking at this issue. We will inform you once the program is compatible with IE9. A new version 1.0.95 is available, all users need to download the new update from http://www.xgenseo.com/software/xgenseo.msi. A new version 1.0.92 is available, all users need to download the new update from http://www.xgenseo.com/software/xgenseo.msi. A new version 1.0.89 is available, all users need to download the new update from http://www.xgenseo.com/software/xgenseo.msi. This is a final reminder about the Google API token update. If you are currently using your own Google API token with PPC BidMax, you must stop using your own Google API token by 10th April 2011. All users need to download the new updated version 5.2.90 of PPC Bid Max from http://www.apexpacific.com/software/dbmsetup.exe to update your current version to the latest version by 10th April 2011. Failure to comply with the Google API terms and conditions may result in your Google API token and Google Adwords accounts to bring cancelled by Google. We apologize for any inconvenience this may have caused. Please contact us at http://www.apexpacific.com/contactus.html if you have any questions. This is an important notification for PPC BidMax. Please read this message fully. We will release a new update version for PPC BidMax in new few days, if you are using your OWN Google API Token within PPC BidMax, please contact us immediately by reply to this email. If you are currently using your own Google API token within PPC BidMax but fail to contact us in the next 3 days, your software will stop working. 3. Then go to the “Options” tab. 4. If you can see “Google Token ID” box under the “Use my own Google API Token” section, then it means that you are using your own Google API token. Please contact us IMMEDIATELY by emailing us at service@apexpacific.com or fill out the contact us form at http://www.apexpacific.com/contactus.html. Once you contact us, you will receive a confirmation from us within 24 hours. If you did not hear us within 48 hours, it means that we did not receive your email and you need to contact us again. If you are NOT using your own Google API token, you can ignore this email as you will not be affected. If you have any questions or concern about this email, please feel free to contact us at at service@apexpacific.com or fill out the contact us form at http://www.apexpacific.com/contactus.html. This is an important update for SEO Suite. Because Google API has been changed, which affects the Keyword Builder function to be working correctly. If you have problem with Keyword Builder function, please downlaod the new update version from http://www.apexpacific.com/update/seosuite_update.exe and install the new update. Please contact us at support@apexpacific.com if you have any questions. If you received "Get Campaign failed: QuotaCheck Error" or anything related to "API Quota Error" issue, please simply re-register the program by clicking the "Help/Register" menu button, and re-enter your registration code to re-register the program. The new XGen SEO version 1.0.71 is available. If your current version is 1.0.71 or older, please update your program to the latest version 1.0.71 with auto-update installer, OR download and install the new version manually from http://www.xgenseo.com/update/xgenseo_update.exe. Implemented WordPress(host) Blog submission: now you can submit article to your company blog account if you are using WordPress blog. Please click "Add Social Site" button from the "Social Site Account Creation" window, and choose "WordPress(host)", then enter your company blog URL and login details. We are interested in hearing about your experience as a SEO marketer. Please take a few minutes to share your feedback at http://www.xgenseo.com/xgenseo/feedback.html. It will help us further improve our products and ultimately serve you better. The new XGen SEO version 1.0.68 is available. If your current version is 1.0.68 or older, please update your program to the latest version 1.0.68 with auto-update installer, OR download and install the new version manually from http://www.xgenseo.com/update/xgenseo_update.exe. Implemented LinkWheel feature, so that for each blog posting, you can create a link point to previous blog. To enable LinkWheel feature, please simply insert a hyperlink as <LINKWHEEL>Link Text</LINKWHEEL>, then the program will replace <LINKWHEEL> with previous blog URL when submitting. Extended URL length from 70 characters to unlimited under the "Email/Social Site Account Info" setting. Facebook: breaking through update for Facebook, after 2 months re-development and update, we finally get Facebook working now. In order for Facebook working properly, make sure to maximize the Submission window when submitting. BlogLines: Removed because this site will be shut down on Oct 1 2010. The new XGen SEO version 1.0.66 is available. If your current version is 1.0.66 or older, please update your program to the latest version 1.0.66 with auto-update installer, OR download and install the new version manually from http://www.xgenseo.com/update/xgenseo_update.exe. so each campaign will have its dedicated IP address, this will dramatically reduce the chance your account to be blocked. The new XGen SEO version 1.0.65 is available. If your current version is 1.0.65 or older, please update your program to the latest version 1.0.65 with auto-update installer, OR download and install the new version manually from http://www.xgenseo.com/update/xgenseo_update.exe. Improved Spinning color coding function. Previously, the program will run through and checks spun words in article every time when adding a final bracket } to a phrase that is spun, this makes spinning extremely slow. Now this issue has been fixed. Implemented Yahoo POP3 mail account, now you can use Yahoo POP3 email account to check emails for account validation. However, you need to login to Yahoo mail manually and enable the "Allow POPed" setting under "Options". Fixed profile setting info did not save error. The new XGen SEO version 1.0.63 is available. If your current version is 1.0.63 or older, please update your program to the latest version 1.0.63 from http://www.xgenseo.com/software/xgenseo.msi. We have noticed that there's a potential issue for users updating the program recently using the built in auto-updater to version 1.0.62. We apologise for any delay and confusion this may have caused. Please contact us at http://www.apexpacific.com/help/technical-support.html if you have any questions or need any further assistance. Or, from the program, please go to "Suport/Support Center"
Due to a technical issue, Yahoo! Search Marketing API is currently experiencing a reporting delay across all EWS end-points. Yahoo! Search Marketing expects to resolve this issue by Thursday, July 29, after which reporting should return to normal over the next 24 hours. The new XGen SEO version 1.0.61 is available. If your current version is 1.0.61 or older, please update your program to the latest version 1.0.61 from http://www.xgenseo.com/software/xgenseo.msi. The new XGen SEO version 1.0.55 is available. If your current version is 1.0.54 or older, please update your program to the latest version 1.0.55 from http://www.xgenseo.com/software/xgenseo.msi. Implemented Account Verification function. Now, the program will go through each site and log in to each account to verify if the account has been created successfully or not, this will make sure the account have been created successfully before you can submit. This is one of the important improvement to increase submission success rate. You can access the "Account Verify" function via "Account Validation" or under the "Article Submission" window. Implemented Test Yahoo Email Account function. Now, you can test the Yahoo email account if it has been created successful or not, this will prevent you have spent a lot of time to create the accounts but later find out that the email account has been not been created yet. Implemented "Pause/Resume" function for Submission process, so you can Pause and Resume the submission process if you like. Implemented "Submission Status Report". Now, you can view detail submission status after the submission. Implemented "StartUp set up wizard" to help user to configure the program properly when they are running the program at first time. Or you can go through the "Configuration" setting wizard at any time by clicking the "Fiile/Configuration" menu button. Vox.com : Fixed Date of Birth not selected properly under the account creation. BookmarkTracker: Fixed Profile setting from Private to Public when creating account. Ning: Limited Keyword and Description length to 200 and 140 characters. The new XGen SEO version 1.0.54 is available. If your current version is 1.0.53 or older, please update your program to the latest version 1.0.54 from http://www.xgenseo.com/software/xgenseo.msi. Using multhreading when solving Captcha to prevent "Program lockup". Previously, during the Account Creation process, when program resolving the Captcha, the program seems to be "locked"
. Now this issue has been resolved. Implemented Login checker function. User can double click on "Social Site Name" column on the "Social Site Account Creation" window to goto the login page and autofill the fields, so you can verify if the account has been created successfully or not, which will help to increase the submission success rate. Implemented "Article Spin Preview". All components of article (Spun) is shown in the Preview tab, this includes Title, keyword tags, summary and Signature. Fixed hyperlink that can not be shown as a link previously for social sites such as Gather, Wikispaces. This issue has been fixed, now all hyperlink will be shown correctly. Fixed Ranking Analysis result which previously may not be accurate at times. Fixed Keyword Builder: "Save Keywords to Library" function is not working properly. Fixed Account Validation issue which some sites have been marked as VERIFIED but actually not verified correctly. This issue has been fixed, now all accounts will be verified correctly. Flukiest.com : This site was under construction but now it is up and running. EasyJournal: This site is back after unavailable for 2 weeks. Zimbio: Currently the account creation is not working for this site. A1-Webmarks: Site was down from last week and is now up and running. OYAX: Site was down from last week and is now up and running. 12 NEW social sites have been added this week, and further 10-15 new sites will be added next week. We are continue updating and improving the software on weekly basis. Please update your program to the latest version 1.0.51 available from http://www.xgenseo.com/software/xgenseo.msi. Implemented Multi-level Spin, now you can spin your article with Multi-level spin patterns. (New) Implemented Auto Version Update feature, now the software will auto detect if a new version is available and update your program to the latest version automatically, you don't need to check and download the new version manaully. (New)Show social site status in the social account list, now you can easily to see the status of the social sites if they are temporary down or have any submission issues. Fixed Email Validation error if you used your own POP3 email address and choose SSL connection option. There are many minor updates for social sites, now you will get better successful rate for account creation and article submission. As you know, social sites changed their system frequently, which affects the program performance, we are actively updating the program on weekly basis, and also improving and adding new features constantly. Please update your program to the latest version 1.0.47 available from http://www.xgenseo.com/software/xgenseo.msi. Resume last interrupted submission feature has been implemented. If the program hangs or stop in the middle of the submission process, just re-start the program, and you will see the "Resume Last Submission" button under the "Submit Article" window. Implemented color coding in the spinning text during article creation, so you can easily analyze your spin patterns. Implemented spin function for video title and description. Implemented separate function for Bookmarking, MicroBlog Submission, RSS Feed Submission and Ping, so you can perform individual submission task at any time. Implemented“URL Manager” function which will contains all the URLs have been submitted by the program, so you can use it on separate submission if you like or use it for any other purpose. Changed Re-try last failed submission process, originally, the program will re-try last failed submission sites after the full submission cycle has completed. Now, the program will re-try last failed submission sites for Blog and Article sites before Bookmarking submission process, this will allow the program to get all the successful URLs before the bookmarking, RSS and Ping process. Add “Validate Account” function as a separate step on Dashboard, so it will be easier in case you need to run the Account validation process multiple times. Implemented “Find and Replace” function under “Article Creation” window, now you can find and replace texts easily, you can also find and insert URLs very easily. If the email account name or social site account name is a number, the program will insert a random letter in front of the number to make it to be a valid username. Fixed Web Ranking function that did not return accurate results, also added Google.co.uk for web ranking. Not reading "month" setting properly during email and account creation. Jam on your Website! Guaranteed!. an outstanding SEO Automation Software with phenomenal results. release of Apex Pacific’s XGenSEO - One Click Social SEO Automation Software. TOP 10 search engine ranking results on Google, Yahoo! and Bing! What does XGenSEO do for you? with a fully automated social media account creation and social submission tool. wikis, social bookmarking sites, video submission sites and RSS Directories. your search engine ranking rockets into the top 10! times to create an explosion of traffic to your website. Why do you need XGenSEO? XGenSEO will do all above with a few clicks of a button! software before May 30th 2010.
software within the next 48 hours. simple to use with its wizard style interface. Get your XGenSEO NOW ! a market leader amongst the Internet Marketing World. that will make you a leader on top of your competitors. our customer service at: http://www.apexpacific.com/help/technical-support.html. Google has upgraded its interface recently which affects the Web Ranking Report feature in SEO Suite. If your version is 8.0.60 or older, or if you are experiencing problems with the Web Ranking Report, then you need to download the latest version 8.0.61 in order to get your SEO Suite working properly for Google Ranking. 3. Please run the Installer/Updater to update the program to the latest edition. 2. Replace the old "seosuite.exe" file which is located (by default) in "C:/Program Files/Dynamic/SEO Suite v8" with the new one. 3. If you’re running 64 bit version of Windows Vista or 7, the default directory is "C:/Program Files(x86)/Dynamic/SEO Suite v8"
If the link is not working, please copy and paste the URL to your Web Browser. After install the new version, you also need to update the Engine Data file by clicking the "File/Update Engine Data" menu. The Engine data file has been updated. If you have any problem to to do the Ranking for Google, please simply update the new Engine Data file by clicking the "File/Update Engine Data" menu button. 1. the sample keywords you're trying to lookup. 3. Screenshot of the lookup result from the program. xGen SEO is just getting better and better every day! If you current version is 1.0.38 or earlier, please download the latest version 1.0.39 from http://www.xgenseo.com/software/xgenseo.msi and update your program. We will continue update the program very frequently in next few weeks, more social sites will be added to the program every week. Please save the above download link and try to update your program on weekly basis in order to keep your program up to date. If you have tried xGen SEO before but wasn’t convinced previously, we strongly suggest you to try the program again, you will see a big difference from 3 or 4 weeks ago. XGenSEO - The Revolutionary Next Generation social SEO Software will be officially released April 22nd 2010. To celebrate this historical milestone, we are offering our valuable beta users the exclusive opportunity to purchase the complete PROFESIONAL Edition(Worth $159.00 / month) of XGenSEO at the same price as the STANDARD edition. And make sure that you buy the final release before April 22nd 2010 to get further 25% discount! To take advantage of this exclusive offer, please click here to order NOW. Why Buy XGenSEO before April 22nd 2010? - We now have 80+ Social Media Sites available to submit to & continuing to add more each week. - We have also implemented automated Video Submission to our growing list of features. - All bugs reported during beta release have been resolved. Don’t miss out on this exclusive offer, click here to buy your copy today! Why use the complete version of XGenSEO? As valued users of XGenSEO, we want to ensure that this revolutionary social SEO software is put into your hands before the general public release. We want to see your websites at the top of the search engines results and to make it easier for you to achieve this, we are offering this exclusive opportunity to purchase the complete PROFESIONAL edition of XGenSEO at the same price as the STANDARD edition. And make sure that you buy the final release before April 22nd 2010 to get a further 25% discount! Buy XGenSEO today! Do not miss out on this exclusive offer, as we WILL NOT REPEAT this generous offer ever again! program to the latest version. BidMax 5.0" with the new one. the URL to your Web Browser. Due to systems maintenance, all accounts located on the EWS21 endpoint will not be accessible for approximately seven hours, from 6:00 p.m. PDT on Friday, April 23 to 1:00 a.m. PDT on Saturday, April 24; and again from to 6:00 p.m. PDT on Sunday, April 25 to 1:00 a.m. PDT on Monday, April 26. Additionally, these accounts may experience delayed “books-closed” times in reports for several hours after the maintenance is completed. Both the API and the UI will be affected. This is an important update for Google Adwords, please read this message carefully. Please note that as per our previous communication,There is a major upgrade for Google Adwords API from version 13 to version 2009. You need to download the latest version of PPC BidMax v5.2.74 before April 22 2010 in order to get Google Adwords to work properly..
3. Please run the Installer/Updater to update the program to the latest version. 2. Replace the old "bidmax50.exe" file which is located (by default) in "C:Program FilesDynamicPPC BidMax 5.0" with the new one. 3. If you’re running 64 bit version of Windows Vista or 7, the default directory is "C:Program Files(x86)DynamicPPC BidMax 5.0"
Please NOTE: we have spent a lot of time testing the program internally and with a selected group of clients, however, since this is a major update, there may potentially bugs or issues that we have not encountered due the complication of Google Adwords and individual Adwords account settings. If you have found any irregularities or issues, please let us know, we will try our best to address all the issues ASAP. We’re very sorry for any inconvenience and delay caused. Please contact us at http://www.apexpacific.com/help/technical-support.html if you have any questions or need any further assistance. There is a major upgrade for Google Adwords API from version 13 to version 2009, now you need to download the latest version of PPC BidMax v5.2.74 before April 22 2010 in order to get Google Adwords to work properly. Yahoo has upgraded its Yahoo! Search Marketing API recently which effect the Reporting and Get Statistic function in PPC BidMax. or if you are experiencing problem to download the correct value for statistic data such as clicks, impression, position and CTR, then you need to download the latest version 5.1.0.70 in order to get your PPC BidMax working properly for Yahoo! Search Marketing. 2. Replace the old "bidmax50.exe" file which is located (by default) in "C:/Program Files/Dynamic/PPC BidMax 5.0" with the new one. 3. If you’re running 64 bit version of Windows Vista or 7, the default directory is "C:/Program Files(x86)/Dynamic/PPC BidMax 5.0"
Google will be performing routine system maintenance on Saturday, February 20 from approximately 10:00am to 2:00pm PDT. You won't be able to access AdWords or the API during this time frame, but your ads will continue to run as normal. Yahoo has upgraded its Yahoo! Search Marketing API from v5 to version 6 recently thus we have updated PPC Bid Max 5.1 so it would work with the new API v6. There is a major update for MSN Adcenter API v6, you need to download the latest version of PPC BidMax v5.1.68 in order to get MSN Adcenter to work properly. MSN AdCenter API Issue has been resolved. This is an important update for MSN AdCenter. If you are currently managing MSN Adcenter with PPC BidMax, please read this email carefully. There is a major upgrade for MSN Adcenter API from v5.1 to v6, you need to download the latest version of PPC BidMax v5.1.64 in order to get MSN Adcenter to work properly. "Invalid client data. Check the SOAP fault details for more information." 3. If you're running 64 bit version of Windows Vista or 7, the default directory is "C:Program Files(x86)DynamicPPC BidMax 5.0"
Google will be performing routine system maintenance onSaturday, November 14th from approximately 10:00am to 2:00pm PDT. You won’t be able to access AdWords or the API during this time frame, but your ads will continue to run as normal. Google will be performing routine system maintenance on Saturday, October 10th from approximately 10:00am to 2:00pm PDT. You won’t be able to access AdWords or the API during this time frame, but your ads will continue to run as normal. This is to let you know that we have identified a bug in Google Adwords API which will effect PPC BidMax to work properly. It has been brought to our attention that there are some Campaign Status inconsistencies between the ones displayed in Google Adwords and the ones displayed in PPC BidMax. For example, your campaign status may show “Active” in Google Adwords web interface, however, it shows “Paused” in PPC BidMax, or vice versa. This issue may not happen to all the clients, but it will not show the statistic data correctly in PPC BidMax. After investigating further, it appears that this is due to the inconsistent data returned by the Google Adwords API. We have contacted Google API Team regarding this issue and Google API team are working hard to address this issue. We will notify you once this issue has been resolved. We’re very sorry for the inconvenience and delay caused. 2. Save it to your local storage and run it. Please make sure the PPC BidMax program is closed when running the update. We would like to thank you for your patience and understanding regarding this matter. Yahoo! Search Marketing had a system launch over the weekend which may have caused the Yahoo! Search Marketing accounts not to work properly in BidMax. Yahoo! Search Marketing technical team are working hard to address this issue. We will notify you once this issue has been resolved. We're very sorry for the inconvenience and delay caused. Google will be performing routine system maintenance on Saturday, September 12th from approximately 10:00am to 2:00pm PDT. You won’t be able to access AdWords or the API during this time frame, but your ads will continue to run as normal. Google will be performing routine system maintenance on Saturday, August 8 from approximately 10:00am to 2:00pm PDT. You won’t be able to access AdWords or the API during this time frame, but your ads will continue to run as normal. Google will be performing routine system maintenance on Saturday, July 11 from approximately 10:00am to 2:00pm PDT. You won’t be able to access AdWords or the API during this time frame, but your ads will continue to run as normal. Google will be performing routine system maintenance on Saturday, June 13 from approximately 10:00am to 2:00pm PDT. You won’t be able to access AdWords or the API during this time frame, but your ads will continue to run as normal. Google will be performing routine system maintenance on Saturday, May 16 from approximately 10:00am to 2:00pm PDT. You won't be able to access AdWords or the API during this time frame, but your ads will continue to run as normal. 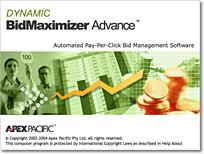 Apex Pacific is proud to announce that the new PPC BidMax V5.1 has been released! This is an exciting kick off to introduce our newest features and functions. As we have taken into ideal considerations of our valued customer’s feedback we bring to you our new and improved product! Our goal is to simplify our customer’s lives. After more than 10 months of re-development and the investment of over a hundred working hours we have brought to you an outstanding product with phenomenal adjustments. Our new features will improve your business sales and expand your opportunities to a bigger and brighter future. Please click here to read the full release note and discover the new features of v5.1. Google will be performing routine system maintenance on Saturday, April 11 from approximately 10:00am to 2:00pm PDT. You won’t be able to access AdWords or the API (through PPC BidMax) during this time frame, but your ads will continue to run as normal. Google will be performing routine system maintenance on Saturday, March 14 from approximately 10:00am to 2:00pm PST. You won’t be able to access AdWords or the API (through PPC BidMax) during this time frame, but your ads will continue to run as normal. Just a friendly reminder to all PPC BidMax users: if you have not yet updated your version to 5.0.48, please do so immediately, because Google has upgraded its Adwords API from v12 to v13, if your version is older than 5.0.46, the program will not work properly for Google Adwords. Please download the latest version of the EXE file from http://www.apexpacific.com/update/bidmax50.exe and save it into the SAME directory of the application, replace the old file with this one. You can download the FULL installation file from http://www.apexpacific.com/software/dbmsetup.exe and re-install. Please contact us at support@apexpacific.com if you have any questions or need any assistance with this upgrade. Google has upgraded its Google Adwords API from v12 to version 13 recently thus we have updated PPC Bid Max 5.0 so it would work with the new API v13. 1. Please download the new "bidmax50.exe" file with the version number of 5.0.46 from http://www.edynamicsoft.com/update/bidmax50.exe"
2. Save it into the SAME directory of the application (by default is “C:ProgramFilesDynamicPPC BidMax 5.0” ), replace the old file with this one. 3. Please run the program and check your version number by clicking the "Help/About …" menu button to make sure your version is 5.0.46. If you have problem to update to the new version, you can download and re-install the full version from http://www.apexpacific.com/software/dbmsetup.exe"
Please contact us at support@apexpacific.com if you experience any problems or if you require any further assistance. Google will be performing routine system maintenance on Saturday, January 10 from approximately 10:00am to 2:00pm PST. You won't be able to access AdWords or the API during this time frame, but your ads will continue to run as normal. We apologize for any inconveniences this may caused. This email is to inform you that the Distributor(Reseller) license for following reseller to resell all Apex Pacific software products under the brand name Dynamic Software has been revoked. However, all Apex Pacific’s product name and brand name including Dynamic Submission, Dynamic BidMaximizer, SEO Suite, PPC BidMax, Dynamic MailCommunicator, Dynamic Web Ranking, Dynamic Email Validator and Dynamic Software are the intellectual properties of Apex Pacific. If you are a client of PPC BidMax(or BidMaximizer), please contact Apex Pacific immediately at service@apexpacific.com to update your contact details and payment information. Dynamic Software Corporation does not have the legal rights to charge you starting from 13th November 2008, this applies to all monthly or yearly subscribed clients of BidMaximizer. You need to contact us at service@apexpacific.com to convert your account to Apex Pacific immediately in order for us to provide you with future update and support. If you have been charged by Dynamic Software Corporation after 13th November 2008, please contact your bank to lodge a chargeback. All payments will need to be made payable to Apex Pacific starting from 14th November 2008. For all future technical support and customer service, please contact Apex Pacific at support@apexpacific.com. Any products sold by Al Costanzo (Dynamic Software Corporation) starting from 13th of November 2008 are not supported by Apex Pacific and do not have any connection to Apex Pacific in any way. All the Apex Pacific products sold by Al Costanzo (Dynamic Software Corporation) prior to the 13th of November 2008 will still be supported by Apex Pacific. To clarify about the email sent by Al Costanzo recently regarding SaaS, it is NOT an upgrade of PPC BidMax(BidMaximizer) and not a part any software release from Apex Pacific. We are sorry for any inconvenience and confusion this may have caused. If you have any question about any part of this email, please contact us at support@apexpacific.com. Google will be performing routine system maintenance on Saturday, November 8 from approximately 10:00am to 2:00pm PST. You won't be able to access AdWords or the API (through PPC BidMax) during this time frame, but your ads will continue to run as normal. Google will be performing routine system maintenance on Saturday, October 18 from approximately 10:00am to 2:00pm PDT. You won't be able to access AdWords or the API(through PPC BidMax) during this time frame, but your ads will continue to run as normal. Google will be performing routine system maintenance Saturday, September 13 from approximately 10:00am to 2:00pm PDT. You won’t be able to access AdWords or the API (hence Bid Max might not update your bids correctly) during this time frame, but your ads will continue to run as normal. We apologize for any inconveniences or confusion. This is an important notice for MSN adCenter clients. We would like to inform you that Microsoft has upgraded their API from version 4 to version 5 . As a result of the latter, you may expeirence some problems when managing your MSN adCenter account with the program. Our development team is working hard on fixing all the issues for an ASAP resolution. However, we will experience a slight delay which will put us just a bit behind schedule to release the new Version 5 supporting MSN adCenter API . Please be patient if you experience any problem with the program, our new version is expected to be ready for release by 29th August 2008. If you have any questions or concerns about the above, please feel free to contact our customer service at service@apexpacific.com. Google will be performing routine system maintenance Saturday, August 9 from approximately 10:00am to 2:00pm PDT. You won’t be able to access AdWords or the API (hence Bid Max might not update your bids correctly) during this time frame, but your ads will continue to run as normal. and update your current version. New version upgrade notice for BidMax v5 - Yahoo! Further to our version upgrade notice last week, there is a further upgrade for Yahoo! Search Marketing as well. Because there are some major updates for Yahoo! Search Marketing, you are requested to upgrade to PPC BidMax version 5.0.31 before 15th July 2007. We would like to suggest all users to download and upgrade to the latest version ASAP. and save it to c:Program filesDynamicPPC BidMax v5 folder, replace the old file with this one. and install, then follow up the installation instruction to convert your account from v4 to v5.0. Where do I get more information about version 5.0? and all the related questions. Help is always available. If you have any questions or concern about this upgrade, please feel free to contact our technical support team at support@apexpacific.com. Google will be performing routine system maintenance Saturday, July 12 from approximately 10:00am to 2:00pm PST. You won’t be able to access AdWords or the API (hence Bid Max might not update your bids correctly) during this time frame, but your ads will continue to run as normal. Since our latest update we have found a small bug that could effect the performance of the program, and we have fixed it. Please check your version number by going to "Help / About" and if it is less than 5.0.30 please update your program by downloading the latest exe file from the following link and save it under the program folder and overwrite the existing one with this one. If you experience any problems with the program, please send your error.log file to support@apexpacific.com and we will get back to you as soon as possible. Google will be performing routine system maintenance Saturday, June 7 from approximately 10:00am to 2:00pm PST. You won’t be able to access AdWords or the API (hence Bid Max might not update your bids correctly) during this time frame, but your ads will continue to run as normal. Google has changed their API version recently thus we have changed Bid Max 4.0 so it would work with the new API. To work without any problems with Google engine, users need to download the new update version of the EXE file "bidmax40.exe" from "http://www.edynamicsoft.com/update/bidmax40.exe" and save it into the SAME directory of the application, replace the old file with this one. After replacing the exe file please run the program and update your engine data by clicking on "File / Update engine data". Please notify us by email (support@apexpacific.com) if you experience any problems. Due to upcoming maintenance work on Miva Search Engine’s servers there will be no API access this weekend, hence Bid Max will not be operational for Miva Engine specifically from 12:00 May 2nd until the evening of May 4th. Your campaigns/ads will continue to run during this time, but you will be unable to access these through the API/ Bid Max to run reports or update bids. Yahoo! Search Marketing API change. This is an important notification for Bid Max 4.0 users. Yahoo! has changed their API version recently thus we have changed Bid Max 4.0 so it would work with the new API system. To work without any problems with Yahoo! engine, users need to download the new update version of the EXE file "bidmax40.exe" from "http://www.edynamicsoft.com/update/bidmax40.exe" and save it into the SAME directory of the application, replace the old file with this one. Google will be performing routine system maintenance Saturday, March 8 from approximately 10:00am to 2:00pm PST. You won’t be able to access AdWords or the API (hence Bid Max might not update your bids correctly) during this time frame, but your ads will continue to run as normal. Google will be performing routine system maintenance Saturday, February 16 from approximately 10:00am to 2:00pm PST. You won’t be able to access AdWords or the API (hence Bid Max might not update your bids correctly) during this time frame, but your ads will continue to run as normal. Google will be performing routine system maintenance on Saturday, January 12 from approximately 10:00am to 2:00pm PST. You won’t be able to access AdWords or the API (hence Bid Max might not update your bids correctly) during this time frame, but your ads will continue to run as normal. New to PPC BidMax - Bid History Feature Now Avaliable! Its hard to improve on the best but Apex Pacific have done it! PPC BidMax 4.0 now includes a new Bid History Feature designed to enable the user to view statistics and information on previous keyword bids including bid cost, impressions recieved from that bid, average position, date/time of bid AND Max CPC! Now you will be able to make better and more profitable keyword bid decisions with the Bid History Feature due to its ability to show you which settings were unsuccessful previously, saving you $$$. +61 2 9662 3433 or service@apexpacific.com. Google will be performing routine system maintenance on Saturday, August 11,2007 from approximately 10 a.m. to 2 p.m. PDT. You won’t be able to access AdWords or the API specifically during this time, but your ads will continue to run as normal. PPC Bid Max may not be working during this time. This is an important announcement for the update of BidMax . Please read the following and download the updated version ASAP. 1. Yahoo!Search Marketing: Yahoo! has updated their backend API to version 2.0, the current API will stop working in 10 days. All clients need to download the last version of BidMaximizer immediately in order to working properly with Yahoo! Search Marketing. 2. Yahoo! Panama :Yahoo! has launched the Yahoo! Panama in the UK, Europe and Australia/NZ market . Our PPC BidMax v4 supports Yahoo! Panama platform for the international market. Please simply download the latest version if your Yahoo/Overture accounts have been upgraded to Yahoo! Panama. 3. MSN Adcenter: after 10 months of development, MSN Adcenter is now finally ready. If you want to manage MSN adcenter, please download the latest version from the link below. - If you are a Premium/Full Service Agency Client paying by IO, you need to contact us and provide your account details before you can use the software. 4. 7Search: 7Search has also upgraded their backend API version, you will need to download the latest version of PPC BidMax immediately in order to make it working properly. Please download a new update version of the EXE file "bidmax40.exe" from http://www.edynamicsoft.com/update/bidmax40.exe and save it into the SAME directory of the application, replace the old file with this one and try again. Further more, we also have a lot of exciting developments going on in the next few weeks . We will give you an update once these developments have been finalised. Yahoo! Panama Platform Now Launching for U.K. / Europe Market. Apex Pacific is excited to announce the news that Yahoo! Search Marketing has now launched their new Panama system, which is the new face of Yahoo! Pay-Per-Click advertising, for the UK / Europe market. PPC Bid Max 4.0 supports Yahoo Panama Platform. Please click on the following link to find out more! May saw the release of Topseos.com listing of the top vedors and products of the Search Engine Marketing Industry. Topseos.com. is a highly reputable resource for evaluating Search Engine Marketing service providers and products. They have ranked Apex Pacific's bid management software,PPC BidMax 4.0 as no.3 on their list of Top 5 Search Engine Marketing Tools. SEO Suite 8.0, our Search Engine Optimization tool ranked extremely well at no.2 also which proves Apex Pacific as the Australian leader in developing Internet Marketig Solutions for website marketers. Appearing on the list is not an easy task with a strict list of criteria to be teted on from pricing of the product to the innovations that set the product apart from the rest. To download your trial copy of SEO Suite or PPC BidMax please visit: http://www.apexpacific.com/download.html or for further information from our consultants please email service@apexpacific.com with any questions. Google will be performing routine AdWords system maintenance from 10 a.m. to 2 p.m. PDT on Saturday, June 9, 2007. While all AdWords advertisements will continue to run as normal, you may not be able to use Bid Max during this period. Last weekend's regularly scheduled AdWords system maintenance was postponed at the last minute. Therefore, Google has rescheduled this month's system maintenance period to occur from 10 a.m. to 2 p.m. PDT on Saturday, May 19, 2007. While all AdWords advertisements will continue to run as normal, you may not be able to perform API operations hence you might experience problems using Bid Max during this maintenance period. Apex Pacific are excited to announce that a new feature Broken Link Checker, has been added to the SEO Suite 8.0. Clients are now able to scan their complete website domain and identify any links which are not relating back to the main site. This new feature will enable you to interlink all of your web pages which will increase your link popularity in the search engines. Easy identification of broken links allows you to quickly fix them saving you time and money. Google will be performing routine AdWords system maintenance from 10 a.m. to 2 p.m. PDT on Saturday, May 12, 2007. While all AdWords advertisements will continue to run as normal, you may not be able to perform API operations with PPC BidMax during this maintenance period. Are you interested in increasing your ranking in ALL the major search engines like Yahoo!, Google and MSN? Do you want to know how to decrease your bid gap by 85%? Wondering how you can save hundreds of hours submitting your website to over 1000+ search engines? Are you wanting to know how to create a sales generating email campaign and send it to the hundreds of emails on your list? The answers to all your questions are contained in the Apex Search Engine Marketing Information Pack! If you are an Australian resident or company and would like to receive a FREE Pack please contact service@apexpacific.com to arrange one to be posted to you TODAY! This information is what you need if you are serious about marketing your business on the internet. Upcoming Apex Seminar in Sydney - Revolutionised Strategies of Search Engine Marketing! Apex will be running their first ever Search Engine Marketing Seminar in Sydney on July the 10th at the Wesley Conference Center. We welcome you to attend! If you’re ready to take control of your online marketing and want to know what options are available to you, then we would welcome you to come along and learn what you can do to become a competitive player in the internet industry. Now we want to see more businesses empowering their online strategies and taking the profit margins to the next level. Let us demonstrate to you the secrets behind obtaining a successful online marketing strategies and how easily you can get your customers to find you. This seminar will be your opportunity to discover what would be the right online marketing solution for your business. How to fast-track your business into the Internet Marketing sector. Apex Pacific are excited to announce that due to popular demand MyEmail Tracker is now included in MailCommunicator Professional FREE for one year. Thereafter there will be a minimal fee to renew the subscription at the cost of US$50.00 per year. MailCommunicator Standard users will still be able to access the MyEmail Tracker Subscription at US$20.00 per month. Mail Communicator is the most simple and user-friendly automated email marketing software that allows you to create, manage and track results of your permission based bulk email campaigns and newsletter distributions. Mail Communicator offers solutions for high volume personalized emails with powerful additional features that will help your business make the maximum profit from direct email marketing. You can read more details about MailCommunicator at http://www.apexpacific.com/mailcomm.html and then make your purchase from https://www.apexpacific.com/shoppingcart/products.asp. You won’t be disappointed with the results MailCommunicator achieves for you so download a FREE 30 Day Trial today or email your enquiries to service@apexpacific.com. PPC BidMax will begin supporting the long awaited MSN adCenter with final preparations being made by our software development team within the coming months. We are really excited to be launching this new feature as PPC BidMax will be the only commercial product on the market which will have the capacity and power to support the search engine making it a unique and very valuable asset to any PPC Consultant. The new feature will be especially important to PPC Agencies who subscribe to the Corporate edition as they will be able to offer their clients an additional service which entails the management of their campaigns within MSN adCenter. We have implemented "Keyword Lookup" function for Yahoo Panama accounts for Bid Max 4.0. Now you can see your current position from the program and Bid Max will use the same bidding algorithm as Google for your Yahoo account. To enable keyword lookup, users need to download the new update version of the EXE file "bidmax40.exe" from "http://www.edynamicsoft.com/update/bidmax40.exe" and save it into the SAME directory of the application, replace the old file with this one. After replacing the exe file please run the program and update your engine data by clicking on "File / Update engine data", then you can use the Lookup function. Ad:Tech is your best opportunity to access the latest information on developments in the Online Marketing Industry. It is a great chance for you to speak directly to suppliers and be enthused by more than 100 international and national speakers who will give their insight into this rapidly changing industry! The Technological Age Isn’t Coming…ITS HERE and as an online business owner you need to exploit it ! Speak in person to our Marketing Consultants and Technical Advisors about how our Services can create a more efficient online marketing campaign for your business to increase revenue and the all important bottom line! Discover how much easier business life can be through the use of Apex Pacific Software and Services! Take advantage of special promotions and discounts only available on the day. MIVA will be conducting routine maintenance on our system this Saturday, January 13, 2007, beginning at 12:00am EST. This maintenance is being done at the lowest customer activity level so that we will not affect you at a time when you are working within your MIVA account. Please be aware that we expect the BidMaximizer to be unavailable for approximately four hours, beginning at 12:00am EST. Google will be performing routine AdWords system maintenance from 10 a.m. to 3 p.m. PDT on Saturday, January 13, 2007. While all AdWords advertisements will continue to run as normal, you may not be able to perform API operations during this maintenance period. What does This account has reached its user specified budget mean? This is a Google message tells you that you have reached your API token budget limit, because Google will charge you for using API. Above message means that your specified API budget has been reached. In order to solve this problem, please login to your Google MCC account and increase your API budget. What does ’This account has reached its user specified budget’ mean? We would like to extend our warm wishes for the upcoming holiday season and would like to wish you and your family a Merry Christmas and a prosperous New Year. We also would like to take this opportunity to say thank you for your business and support over the years. Our support team will still answer emails through the Holidays, however, please be patient as our response time may be a little slower than usual, to contact our support team click here. May you travel safely over this busy festive season and come back refreshed for a successful 2007. As you are aware, Yahoo will officially launch the new Panama system on December 19 2006, some of our clients may already upgraded to the new system prior to the official launch , BidMaximizer V4.0 will support Yahoo’s new system. - For US clients: US clients will start to upgrade their Bid Maximizer accounts to the new system, once they convert their Overture account to the new Panama platform. They need to download the new update version of BidMaximizer V4.0 to work with their new account. - For international clients (non US Clients): International clients will start their upgrade in first quarter of 2007, until that time, they will need to continue use the current BidMax Overture V3. 1- If you are managing BOTH Google and Overture/Yahoo with your Bid Maximizer (if you own both Bid Max V4.0 and Bid Maximizer Overture V3.0 registration keys) then please contact us right after your Yahoo account is upgraded to Panama. You will need to get a new registration code for Bid Maximizer v4.0 to use both Yahoo Panama and Google. So PLEASE CONTACT US as soon as your Overture account gets upgraded to Yahoo Panama. 2-If you only manage Yahoo, and IF YOUR ACCOUNT IS UPGRADED to Panama platform, you can download the Bid Max 4.0 and enter your current registration code to register the program. Once you get your Overture account upgraded, you can download and start using the Bid Maximizer V4.0 for Yahoo Panama. 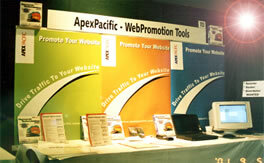 Apex Pacific is proud to take part in Ad:Tech Interactive Marketing Exhibition 2007. Sydney will host the first annual ad:tech on Feb 7-8, 2007 providing a complete look at how the intersection of marketing and technology will change the way your customers interact with your brand. Please join us at Ad:Tech Sydney 2007, on February 7 - 8, 2007. We will demonstrate our award winning Internet Marketing Suite, plus Training and business opportunity that will help you to grow your business online. Google will be performing routine AdWords system maintenance from 10 a.m. to 2 p.m. PDT on Saturday, November 11, 2006. While all AdWords advertisements will continue to run as normal, you may not be able to perform API operations, and may not be able to use Bid Maximizer to update your bids during this maintenance period. Because of the recent changes to Google server and API, some of our customers might experience errors updating/autobidding their bids to Google server. Engine data file has been updated. If you have problem to retrieve the current position and competitor bidding information for Google, please simply update the new Engine Data file by clicking the "File/Update Engine Data" menu button. Following to our notifications last couple of weeks, we would like to provide more information regarding some changes due to "Google Adwords API". 1. If you qualify for "Free Quota" from Google, you will only need to install the new version of Bid Maximizer 4.0 and you can use the program without any new charges. 2. If you do not qualify for "Free Quota" then you will be charged 0.25 cents per 1000 quota used. If you still have not updated your Developer token information and have not applied for Application token please apply before 9th of October. This is the new deadline that Google has set and if you do not apply for and Application Token and Update your details then "Bid Maximizer" will stop working on 16 th of October. Based on your feedback, we understand that end of quarter processes have made it difficult for some of you to meet the September 15 registration deadline. Therefore, we are extending our deadlines by a few weeks to give you more time to complete the registration and migration process and implement your new Application Tokens. which includes entering developer and application information, accepting the Terms and Conditions, and entering billing information. Token Implementation - Starting October 16, the AdWords API will no longer accept requests that do not contain an approved Developer Token and Application Token. If you have not completed the registration process by this date, your API access will be suspended until the registration process has been completed and we have had time to review the information. Billing - Since we are extending the registration and token implementation processes, we are delaying the accrual and billing of AdWords API fees until November. Therefore, starting November 1, all developers will begin accruing API usage fees. Following to our launch yesterday, we have discovered some minor "Program Bugs" that could effect the way program is working. We have made some changes and fixed all the known "Bugs" that causes any known problems. After installing please make sure you have "Version 4.0.09" under "Help / About". It’s finally arriving, the new version of our SEO Suite, version 8.0!! This is the latest, state-of-the-art search engine optimization tool that you can find in today’s market. All the functions you will ever need to optimize and get your website ranking higher in the search engine can be found here. The SEO Suite will include advance technologies to help you get your website properly optimized and climb above your competitors in the organic search results, of all search engines. The new interface is user-friendly and will guide you through the steps of optimization. With a few clicks, you can increase your web traffic and ranking positions in no time. Welcome to the new generation of Bid Management Technology! With all the changes that are happening to the Pay Search Marketing world; the complexities and complications; advertisers need a tool to dynamically keep up and help manage their bidding. Apex has stepped up to the plate and is launching our new consolidated Bid Maximizer version, which can manage both Google Adwords and Yahoo Search Marketing campaign, all in the one program. Our latest version of Bid Maximizer will make life much easier. With the new face lift, this tool dominates the PPC industry. Save yourself time and effort by managing your pay-per-click campaigns more effectively. Be able to monitor and manage your campaigns without the tedious job of logging into each search engine. We’d like to update you on the recent announcement from Google about the AdWords API Beta Program revisions. If you have registered Google Adword API Token, you should also receive this announcement from Google. With this announcement, all AdWords API token-holders will need to register by September 15 to ensure that their developer tokens are not temporarily disabled when the program revisions are rolled out on October 1, 2006. During the registration process, you need to apply for a new "Application Token" and provide your billing information as well. You need to use a new Application Token together with your AdWords API Token in BidMaximizer. So, please register your Application Token ASAP before September 15. We will post more updates in the next few weeks. If you have any questions about this, please contact us at support@apexpacific.com. Click here for access to over 12 million monthly unique visitors from the only search provider that offers vertical search and targeted ad distribution in one place. we are offering you the first chance to try the Beta version. Offer Expires 15th April 2006! please contact our Customer Support team at sales@apexpacific.com. Know how many recipient opens your email message. Display the progress of your campaign over time. Know more where you getting conversion from and aim your campaign to certain demographic area. This service available as a subscription for as much as $19.95 /mo. (5000 page views, additional charge apply if you exceed the page views). Each purchase of Dynamic Mail Communicator comes with 30 days Trial Period of this Email Tracking System. Apex is currently developing an Email Tracking System, that will enable email marketers know how effective their email campaigns are. It is packed with all the features such as ROI Reporting, Page View, Click-thru and Conversion Reporting, and it will be an integral part of Dynamic Mail Communicator. No estimate release date given up to now. We would like to inform you that Overture has made some major changes this weekend, one of the major update was that Overture released a new version 1.2 of the backend system, with this update, all the previous version 1.1(Overture’s backend system) will not longer working any more. In order to make your Dynamic Bid Maximizer™ Overture working properly, please follow the link below. We are please to announce that Dynamic SEO website is Launched. Dynamic SEO is an integrated Web site Promotion and Internet Marketing Services that allows you to: Submit to 1000+ Search Engines, Optimize your Web site, Manage your Pay Per Click Bids, Guaranteed inclusion in the Search Results. Apex Pacific, the leading developer of smart internet marketing solutions, has launched version 3.0 of Dynamic Bid Maximizer™. This is the first dramatic upgrade of Dynamic Bid Maximizer™ in four years. Enhanced features in version 3.0 allowing online marketers to take a full control over their PPC search engine advertising investments. The tool supports two industry giants search engines Overture and Google AdWords and also other major pay-per-click search engines including Findwhat, 7Search, Enhance Interactive, Kanoodle etc. Please join us at CeBIT Australia 2003, on May 6 - 8, 2003. We will be displaying the Web Promotion Products and tools that will help you increase traffic to your website. Please join us at AIIA Software Showcase 2002, on Wednesday 29th of May 2002. We will be displaying the Web Promotion Products and tools that will help you increase traffic to your website. We have been selected as finalists for AIIA’s prestigious iAwards for Dynamic software. The Awards will be presented on Wednesday 17 October 2001 at Sydney’s Westin Hotel. Please join us at AIIA Software Showcase 2001, on Wednesday 5th of sep. 2001. We will be displaying the Dynamic Submission 2000 and other web promotion tools that will help you to increase traffic you by doing the search engine submission right way. A high profile, business-to-business event, the Showcase brings together Australian software developers, buyers, investors, R&D organizations, systems integrators, development partners, alliance partners, and media representatives. It is the only event of its kind in Australia where exhibitors demonstrate their software products and capabilities in a simple, no frills exhibition format. Following is our current 2000 & 2001 schedule for shows we will be displaying at. We often add more shows to our schedule, so check back regularly. Come to meet our friendly staff and people behind the software, and drop by and visit us! We'll be in next march's Comdex in Sydney to showcase our web promotion software which includes Dynamic Submission 2000, make sure you come down and visit us. The e-Business Marketplace ITExpo is Australia's major business to business event for the IT community. Thousands of buyers and decision-makers, from the corporate and SME sectors, government and the Channel attend ITExpo to evaluate the latest products and technology, discuss applications face-to-face and make informed buying decisions. We will attend the Business Software World, Australia 2000 show during the period of November 28, 29 and 30th. We will be displaying the Dynamic Submission 2000 and other web promotion tools that will help you increase traffic by doing the search engine submissions right way. We have been selected as one of the finalists in the Small Business Show's Brother Business Software Awards 2000, for our Dynamic Submission 2000 web promotion software. We will be on air on Channel 9, at Sunday 7:30am AEST, 26th November. So be sure not to miss us when the program is on. The Nine Network's Brother Business Software Awards offers small business in Australia the chance to showcase it's software at next year's CeBIT computer trade fair in Germany. The awards are open to developers on all major platforms. There are three categories. The main category is aimed at finding Australian products with universal potential. The Internet category is for Australian-developed Internet software applications. The third category is for Australia-specific applications.